This screen grab illustrates the contents of the spreadsheet. The spreadsheet is easy to follow. It simply minimizes the sum-square residuals (difference between predicted and actual values of p/z) by varying G. You can also choose to vary (p/z)i in addition to G to minimize the sum-square residuals, but since this value is usually accurately measured, this is not recommended. 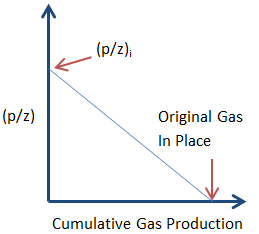 Fundamentally, this method is pretty simple to understand - we're simply locating the intercept on the x-axis (where p/z = 0) of a straight line fit of G against p/z, as illustrated by this picture.